Man, I wish I thought of this topic! But I didn't have to because my friend and former co-worker Nicole Boose did! Nicole worked with me at Marvel and we were in the same office for a good portion of our time together. I loved working with her and she is one of the most chill people I know. We're still in touch often even though we haven't worked together in years. This was her guest spot on GEEK MOM which looks like a fantastic site! Read her blog on how comics editing prepared her for parenthood. It's excellent! This past weekend was WONDERCON in San Francisco. I was there for part of the day on Saturday and part of the day on Sunday. I mostly worked the IDW booth except for when I had to leave to take a handful of meetings. All of which went remarkably well. Usually, they're kind of hit or miss, but some really interesting things to follow up on from business perspectives and a few potentially cool projects. The booth was rocking. A lot of interest in IDW's big announcements and the books we were already doing. I personally most have sold 20 copies of our new JERICHO comics that continue right where the TV show left off and are written by the show's creator himself. GODZILLA was moving fast, too. No surprise there after it's incredible debut this past week. 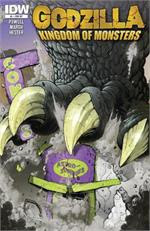 Special props go to IDW's Chris Mowry who had the idea about the amazing retailer exclusive covers for GODZILLA #1 that rocketed that book to one of the industry's top slots for the month, for sure. Chris is one of those guys behind the scenes at IDW most of the time--but his enthusiasm is darn near unmatchable. IDW announced that it will be publishing the next TEENAGE MUTANT NINJA TURTLES comics, and I can't say much more, but boy, are there a lot of people eager to see that--and work on it. IDW also announced its next ARTIST EDITION BOOK featuring Walter Simonson's THOR. I know, that's odd, but it's true. Editor Scott Dunbier personally scanned all the original artwork from Walt himself to make for what is sure to be one of the most sought-after and talked about books coming out in 2011. I held the TRANSFORMERS and G.I. JOE panel on Sunday afternoon. The panel went very well and I had the pleasure of showing off some of the art for G.I. 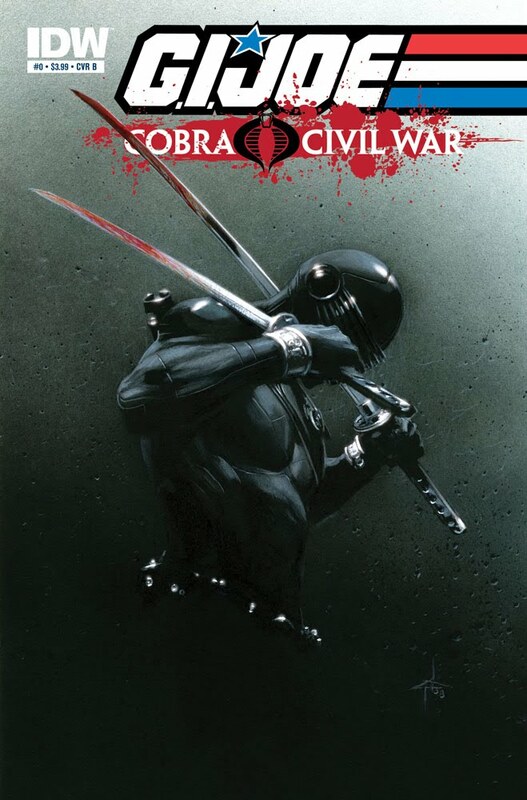 JOE: COBRA CIVIL WAR for the first time. This is an event running through three new G.I. JOE titles--G.I. JOE, SNAKE EYES, and COBRA. All of these launch with #1 issues in May. The core concept is that with the Cobra Commander dead, Cobra has created a contest--he (or she) who kills the most Joes, wins the reflective face-plate thingy and leads the organization. It all kicks off in just one week with G.I. JOE: COBRA CIVIL WAR #0--seen here. I then got to announce the new TRANSFORMERS event. Starting in July, the TRANSFORMERS ongoing series is going to go bi-weekly with issue #21 as we kick off into CHAOS--an event so big, it needs two writers! Both Mike Costa and James Roberts are pulling duty here. 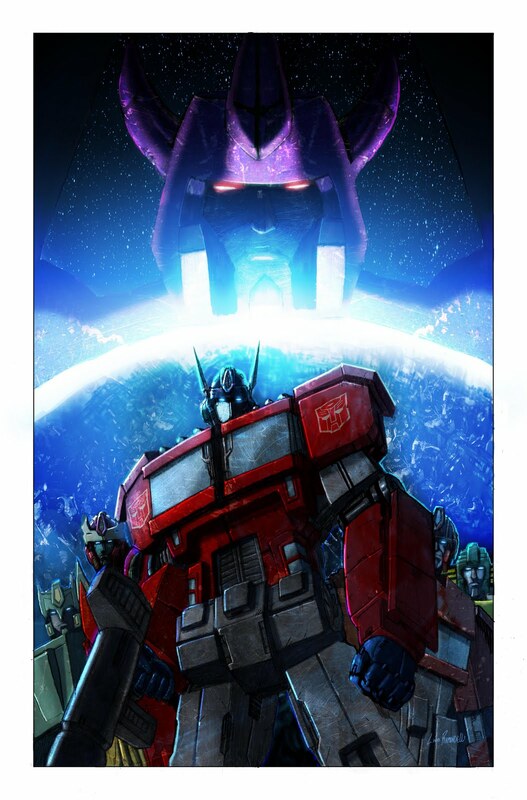 The final fate of the planet Cybertron will be decided, as will the relationship between man and the Transformers. A lot is going to go down as kick this series into high-gear. Okay, enough hype from me. I'll have more tomorrow!